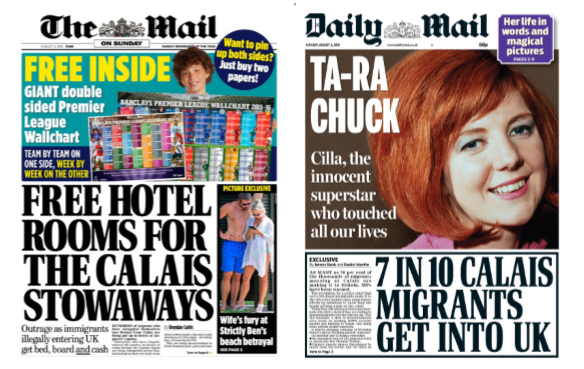 Setting the tone for the week, the ‘Mail on Sunday’ in their front-page report expressed outrage that hundreds of ‘illegal’ migrants arriving in Britain from Calais are being put up in hotels at tax payers’ expense. The problem? There were not ‘hundreds’ but at most one-hundred being temporarily accommodated in hotels, and these people were not ‘illegal migrants’ but asylum seekers fleeing war and terror. The next day the Mail continued its onslaught against the Calais refugees with another front page claiming that, ‘70% of the thousands of migrants massing at Calais are making it to Britain.’ The problem? The Mail had misquoted the Chief Constable of Kent’s evidence to Parliament. He said that 70% of the migrants in Calais leave within four months but it wasn’t known how many of them go elsewhere in France or reach Britain. ‘There’s no evidence that 7 in 10 Calais migrants are entering the UK’. But this little half-hidden full-truth in the story didn’t stop the Mail calculating all their statistics on the false premise that Mr Pughsley had instead said, as their opening story claimed, that 70% do make it to Britain (even though Mr Pughsley never said that). 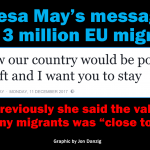 On that basis then, since there are estimated to be 5,000 migrants now ‘amassed’ in Calais, according to The Mail statistics department it must mean that around 3,500 (i.e. 70% of 5,000) were making it to Britain. Oh and that of course must surely mean that 900 of these ‘illegal’ migrants are arriving from Calais to Britain every month. It’s nonsense of course, but this is the world as The Mail sees it; or rather as they want their readers to see it, because this misinformation (rather than the truth) reinforces their readers prejudices against asylum seekers. And that, of course, is how the Mail sells their newspapers to their ‘market’. 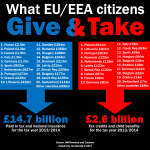 Since this was now being repeatedly circulated by The Mail as the truth, other media and politicians could quote from it, reinforcing that yes, the Mail must be right, others are saying it too. If anyone asked the Mail where this so-called ‘fact’ came from, the Mail could vaguely answer oh, it was the Chief Constable of Kent who said this, and he must surely know! The same technique was employed in the ‘Mail on Sunday’ story claiming that ‘hundreds’ of migrants illegally arriving from Calais were being put-up in hotels at tax payers’ expense. That’s at least what the story reported on the front page and first paragraphs. Lower down the story on the inside pages, however, the Mail added, as an aside to the main thrust of their article, that only 100 were being accommodated in hotels by Serco, the private firm contracted by the government. Did the Mail hope that readers wouldn’t spot the difference between ‘hundreds’ and ‘one hundred’? And only lower down the story did The Mail stop referring to ‘illegal’ migrants and instead correctly describe them as ‘asylum seekers’. It seems that at the Mail’s highest management not an eyebrow is raised nor a forehead furrowed when it’s pointed out that so-called ‘facts’ presented in the opening headlines and paragraphs of an article don’t match what’s presented “lower down in the story”. Those who have studied the Daily Mail method of journalism might agree with me that this is a well known technique. In my view, these two Daily Mail stories misreported the truth to enable a sensational front page headline and opening paragraphs, which were then ‘balanced’ by more accurate information albeit subtly hidden ‘lower down’ the story. That way the Mail, if challenged (as indeed I have challenged them) can respond that that their story, after all, was accurate, because look, there it is ‘lower down’ in the story. (Even though the front page headline and opening sentences didn’t match what was presented ‘lower down’). This is surely too clever by far to be considered a mistake? Could this be a purposeful technique employed by the Mail to enable them to fashion their headlines and stories to match a view of the world which they know will appeal and therefore sell to their market (readership)? I wonder how many Mail readers actually spotted that the headlines and opening paragraphs in these two stories bore little resemblance to the more accurate but less noticeable reporting that inconspicuously took place ‘lower down’? In fact, how many readers just glanced at the front page headlines and never actually read the rest of the story on page 5 or 10 or wherever? Some might consider that presenting seemingly incorrect or misleading information in the headline of a story and then subtly balancing it with more accurate information ‘lower down’ to be the work of geniuses, worthy of a post-graduate thesis on effective propaganda techniques. 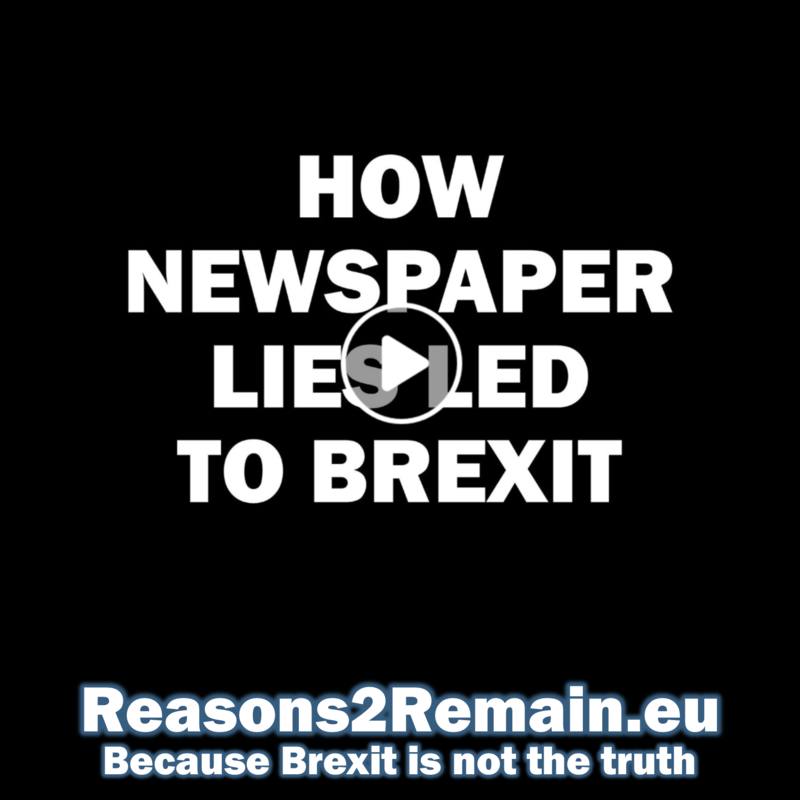 But I consider this to be the lowest form of journalism, that does not serve the interests of this country or its citizens well, or that of refugees who are fleeing horrible wars and terror. Daily Mail and Calais: Making it up as they go along? This entry was posted in Current Affairs, Democracy & Citizenship, Global & International, Law & Justice, Media & Communications, Politics & Public Policy, Publications & Events, Society & Culture and tagged asylum seekers, Calais, cartoons, channel tunnel, Cilla Black, Daily Mail, illegal immigrants, immigrants, Jon Danzig, Mac, Mail Online, migrants, refugees. Bookmark the permalink. Next: Why is Britain so against migration? The Daily Mail – sloppy inaccurate gutter journalism pandering to fear and prejudice at its worst. Gutter journalism is 2 rungs higher….. The mail is an appalling rag whose only Mission seems to be demonising anyone non British. No-one knows how many illegals are coming into the UK, that’s why anyone who offers an estimate cannot be ‘wrong’. They are being housed in hotels across the UK, so why cannot the Mail report that? And none of them are refugees if they came from other safe countries. They are shopping around looking for the best deal from a gullible nation . The Daily Mail quoted the Chief Constable of Kent as saying that 70% of Calais migrants/refugees make it to the UK. The Chief Constable did not say that, and so the Daily Mail was wrong to categorically state that 7 out of 10 Calais migrants were making it to the UK. Kent Police requested a correction. 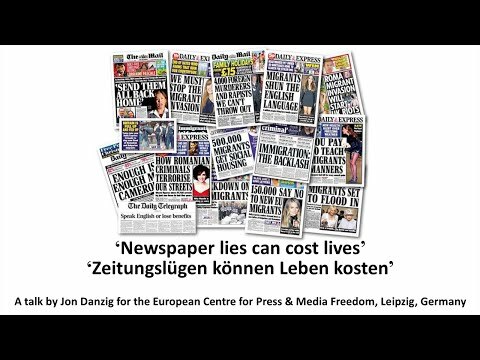 The Daily Mail story was fundamentally incorrect. Those in Calais are mostly not ‘illegals’ but according to those working in the field, including the United Nations, they are refugees. There is no international law that states a refugee must seek asylum in the first safe country they reach. However, there is an obligation for France to properly process those now gathered in Calais, rather than letting them live in appalling conditions called ‘the jungle’. There is a fundamental difference between ‘economic migrant’ and ‘refugee’. Economic migrants can voluntarily leave their home country to seek a better life somewhere else, and they can volunteer to go back home again. Refugees cannot; however many safe countries they pass through, they still cannot go back home (which is where most refugees would rather be). The first goal of a refugee is to find safety; but after that it’s quite natural to want to find somewhere to start life again if it seems obvious that there are no prospects to return home. Many refugees are stuck in camps for years; they might be safe, but it’s hardly a place to start life again. Finally, please note that whilst I welcome comments and opinions including those that oppose mine, I am no longer accepting anonymous comments. Here’s my email address……do you require a passport as well? So the Mail misquoted him….what’s the problem? Did it mean that no-one was sneaking in to the UK? The UN has no moire right to make that claim than anyone else. It doesn’t mean that they are genuine refugees, especially if they came to France from a safe country.The very fact that they aren’t claiming asylum in France proves this. ” There is no international law that states a refugee must seek asylum in the first safe country they reach.” Correct, but every genuine refuge seeks refuge at the earliest opportunity until such time as it’s either safe to go home or they apply for asylum in the correct way. They don’t hop from country to country. “Economic migrants can voluntarily leave their home country to seek a better life somewhere else, and they can volunteer to go back home again. Refugees cannot; however many safe countries they pass through, they still cannot go back home ” Of course refugees can ‘go home’ once the perceived threat is over. ” The first goal of a refugee is to find safety; but after that it’s quite natural to want to find somewhere to start life again…” And if they do that then they are no longer refugees. A Syrian living in a camp in Lebanon is a refugee. A Syrian who enters Turkey is a refugee. A Syrian who leaves Turkey for Lebanon is not a refugee. Refugees take refuge. Thank you for providing your name; previously you were just posting as ‘Nigel’. Without wanting to go around in circles, the Daily Mail misquoted the Chief Constable of Kent. So whilst you and I can agree that exact numbers of people arriving here from the ‘camp’ in Calais are not known, the Daily Mail gave a precise figure, wrongly attributing this to the Chief Constable. I think we’re actually agreeing with each other, and we can surely close this part of the discussion. The Mail, after all, was asked to publish a correction by the Kent Police, which they duly did (although the Mail correction was not clearly written). We’ll have to agree to disagree regarding your definition of a refugee. However, you might agree with me that the long-term goal needs to enable refugees to go back home, which is where most want to go. The 1951 Refugee Convention spells out that a refugee is someone who “owing to a well-founded fear of being persecuted for reasons of race, religion, nationality, membership of a particular social group or political opinion, is outside the country of his nationality, and is unable to, or owing to such fear, is unwilling to avail himself of the protection of that country.” I don’t believe someone stops being a refugee because they have passed through safe countries; they remain a refugee for as long as they are unable to return home. There is nothing to stop France processing those people in Calais to ascertain their status and provide support as necessary. Many refugees feel completely unwelcome in many safe countries they pass – for the simple reason that they are unwelcome. Britain will only allow those in Calais to arrive here ‘illegally’ – but once they have arrived, many are offered asylum. That to me seems disingenuous – we will accept people as ‘asylum seekers’ but only if they have risked their lives to get here (and many have been killed trying to make the journey). 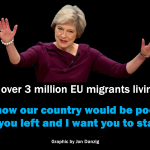 If all those ‘illegally’ arriving here from Calais had they application for asylum rejected, then I think you’d have a case: that none of them are genuine refugees and are simply ‘economic migrants’ who should no doubt be deported. But in fact, many arriving here from Calais are being accepted as asylum seekers. There surely needs to be a better, more efficient and humane way to deal with this international crisis.